Thank you for taking the time to read the Save New England Quarterly Magazine! We pray that God would bless you through this ministry publication. You will find encouraging articles, convicting truths, upcoming events, and helpful recommendations in each issue. 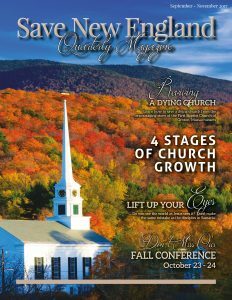 SNE Quarterly Magazine is printed and managed by Add To Your Faith Publications. Links will direct you to their website for payment. You can have a copy of the issue mailed to your address for $20 per year. You can have multiple copies shipped to your church each quarter. Your church will enjoy seeing the great things God is doing in New England and learn more about revival, soul winning, and church planting. are free when you provide your email address below. help us pay for the printing of the magazine. Learn more about opportunities and rates HERE. Follow us for encouraging updates and important prayer requests. Keep up with the great things God is doing in New England. Subscribe to receive ministry updates and receive access to the digital version of our popular quarterly magazine. Don’t worry. We hate spam too. We will protect your information.